Here’s another great small project for the holidays. Its a small Contemporary Clock. This piece should take about two days to build. And this is another project that can benefit from the batching process. So be sure to make a bunch! This is the plexiglass template kit I used to create the holes for the clock works. Highly recommended!! Hey Marc, Great project! Looks wonderful. Where did you get the clock insert? If the hole for the clock is too small, it won’t fit. If the hole is too big, the clock will fall out. Are there some springy things or something like that on the clock itself to accommodate a hole that’s not exactly exactly exactly the right size? Fantastic project Marc. I really like the keys. I will have to give this a shot. Anymore quick Christmas gift episodes in the works? I have thoroughly enjoyed the past two episodes. 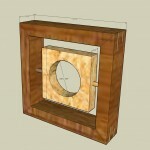 Hey Demowen, I put a link in the write-up to Woodcraft’s clock parts. They have some decent options. Russ, the clocks have little plastic springs that provide the tension to hold the clock in place. As long as you make the hole the recommend size, you should be in good shape. Re the springs: Perfect! Thanks. Marc, where are your archived videos? I left just over a week ago to take my wife on a cruise and when I got back you had updated your website – one needs to do that every once in awhile – and I could not find the archived videos. FYI – I had started with #1 and gotten up to about #9 and enjoyed each. The category organization is the same but its a little easier to access. Hey Greg. I actually used the Fuji for those projects. The reason is because the nut that holds the cup top on the gun of the Earlex actually broke. It was like it had a weak point in it and just split down the middle. I called the company and had a replacement almost immediately. Thanks for doing these easier projects too. Not all of us are ready for the big leagues yet, and things like this really build confidence. I did the pencil holder last year and those came out really well. Looking forward to trying this one too. Nice project you got there… Easy and simple for the beginners and all. And you got me Laughing really hard when you were Polying some of your wood, when you said “You could use anything you want to clean up the Hole, Like a Screwdriver”. HAHAHA, that was so funny I was laughing for a few minutes, my Boy has a Plastic Hammer and Screwdriver, and I was trying to fix it while back, and he said Hang on Daddy let me go get my Hammer, That WILL Fix it. I had to tell him that Hammers won’t fix everything lol, but thanks for the thought. PS What sheen was your PolyAcrylic? Your work is always artistic and well-crafted. You could make those available for sale on your site … I’d but one, and I’ll bet a bunch of us ‘wood’ just to have an affordable piece of your work. Maybe even a silent auction! I connected with your video on the torsion box and was instantly hooked. I teach high school math and do a lot of construction/woodworking on the side. You are a natural teacher. I’ll just say thanks and move on to my question. You tend to answer the questions that pop into my head as you are explaining things, but I was wondering why not finish wood before you cut it? Such as in the contemporary clock. 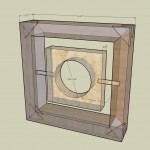 Why not finish the wood, then cut the miters? You waste a little finish, but you don’t have to worry about taping or squeeze out ruining the finish. Hey Chris. Pre-finishing is always an option. But many times there is a logical reason not to. In the case of the clock, we still have to cut for the splines after the glueup and then flush them to the surface. This process would ruin the finish. Also, keep in mind that miter joints are rarely absolutely perfect. Its always nice to have the option of sanding the joints a bit after the glueup. If they are finished, you won’t be able to do that. So before I pre-finish anything, I try to think the project all the way through just to make sure there isn’t something that I am going to have to do that will screw up the finish. In the clock video you show 7 inch wenge. On the drawing its 61/2 inchs. How come? I like cutting my pieces a little oversized if I am doing miters. That way I can carefully dial in the fit without the fear of cutting too far. I can’t wait to get started on this project for this year’s Christmas presents. By the way, what size clock inserts did you use for your project. 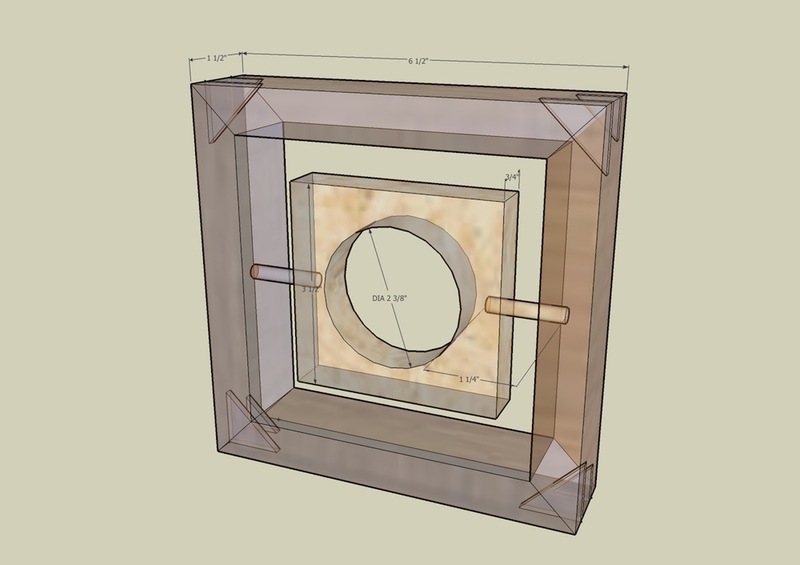 I ordered 1 7/16″ inserts, and I’m worried that they will be look small for the 3 1/2″ hickory block. Thanks. Those might be a bit small. I believe I used the 2 3/4″ clocks in mine. Great project! I am going to batch out 5 of them for gifts. 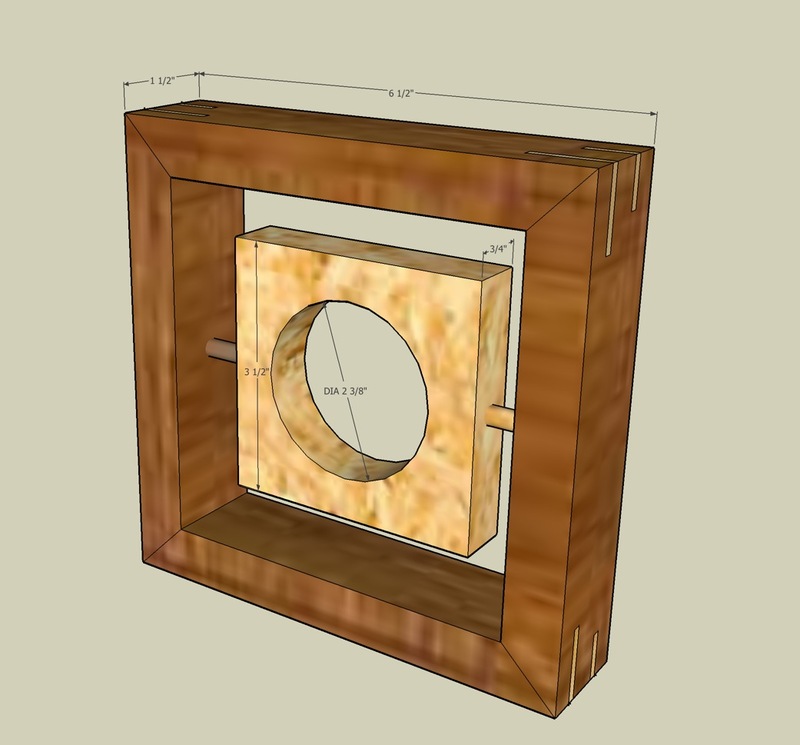 Did you use 1/2 or 1/4″ dowels to support the clock in the frame? Great video as always. You cram in so much info and it is all useful info. The rhythm of the videos are tight. You make it look easy but it wouldn’t be for me and I’ve seen others, too, who would make it too dense or leave out key points. Neat project with all kinds of potential!